and also in improving the infrastructure of the state. While speaking at the Nigeria Governors Forum Media Conference for Chief Press Secretaries and Commissioners for Information from the 36 states in Abuja, yesterday, Ikpeazu, who was represented by his deputy, Ude Oko Chukwu, also said the state government enshrined transparency in the governance of the state, where every Abian was updated quarterly on the affairs of the state. Speaking on the topic, “Application of the Paris Club Refund to State,’’ the governor said: “The receipt of the intervention funds has become a source of concern to some analyst, pundits, social critics and political commentators. Some comments have been made in the print and social media, which were half truths and sometimes outright lies. “May I use this opportunity to briefly state the facts. 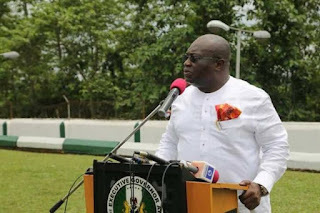 Interestingly, Abia State government received the following intervention funds from the Federal Government: Bailout fund of N14.2 billion, first tranche of Paris refund of N10.6 billion and second tranche of the Paris refund of N5 billion. “In line with the transparency approach to governance of the current administration, after the receipt of the first intervention (bailout) fund, Abia State government constituted a committee made up of the different labour union leaders, namely NLC, TUC, NULGE, NUP, NUT and Joint Negotiating Council. “The committee took charge of the disbursement of the funds to various areas of greater needs and exigencies. “50% of the first tranche of the Paris Refund to be dedicated to the payment of workers’salaries and wages. We also disbursed an additional N600m to augment the payment of workers’ salaries and wages. Thus a total of N5.9b was spent therein. “The second tranche of the Paris refund received by Abia state was 100% spent on workers’ salaries and pensions. This has greatly curtailed the salary arrearsand responsibilities of the government. “Overall, Abia received a total sum of N16.3B from the Paris Club refund and deployed N11.6B to service workers/pensioners wage bill. This translates to a commitment of more than 71% of total receipt to service workers’ salaries and pension.” The Governor said. The governor also spoke on the efforts made by his administration to ensure that workers get salaries as at when due, by introducing the verification and biometric exercise to curb ghost workers. “With the introduction of the verification and biometric exercises some issues such as ‘ghost worker’ salaries, padding of salaries, multiplicity of people receiving salaries from various units of the government has been addressed. “This has assisted the State greatly, as the monthly wage bill has been reduced from an average of N2.8b to N2.1b. Thus from this alone a savings ofabout N600m monthly has been achieved. When extrapolated in 34 months this amounts to about N16b that would have ordinarily gone into some individuals’ accounts. On the issue of pensions he said: “Hitherto there were 19 Sub-treasuries through which Pensioners were paid. These sub-treasuries determined when and how to pay the pensioners. This brought about sharp practices in the system. The government therefore decided to abolish the sub-treasuries system. “To address this issue the State embanked on Pensioners Verification Exercise (PVE). This has helped the State to identify non-retirees in the system. Thereafter, the e-payment system was adopted. This led to the simultaneous payment of all pensioners through their banks. Today, pensioners receive their pay at the comfort of their respective homes.